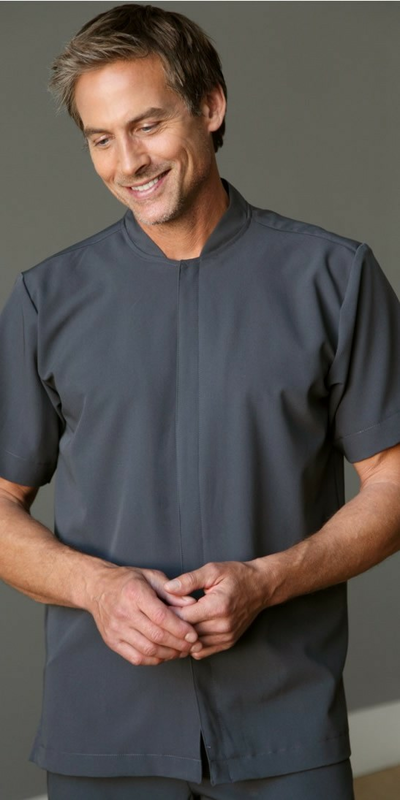 For a professional first impression, outfit your male spa employees in our Men's Stefano Short Sleeve Spa Shirt. The soft, stretchable, lightweight blend material will enable your staff to remain cool and comfortable and enjoy a full range of motion while performing treatments. "Essencia Stretch" Fabric: lightweight and stretchy -"flexes and moves as you move" for amazing comfort and fit. Soft & silent. This is a great looking shirt made from quality materials. My boyfriend is a massage therapist and likes the shirt because it's breathable but still looks professional. I gave it five stars because the shirt is great but also because Averills customer service was excellent. I would order from this company again.